Ah, the airport bookstore. As monetary theorist and history buff, I could not resist this tantalizing title: Debt: The First 5000 Years. The book is authored by anthropologist David Graeber, a leading figure in the Occupy Wall Street movement. But what grabbed me was the summary on the back cover, which states (among other things) that every economics textbook is wrong in the way it explains the emergence of money, which goes something like this: "Once upon a time, there was barter. It was difficult. So people invented money." [p28]. I think we (economists) have to score one for the anthropologists here. I remember being taught that story and it took me some time to figure out it was wrong. What makes barter difficult? We are taught that the difficulty stems from a "lack of coincidence of wants." Consider, for example, an island populated by three people, Adam, Betty and Charlie. Adam wants breakfast, Betty wants lunch, Charlie wants dinner. Adam can deliver dinner, Betty can deliver breakfast, and Charlie can deliver lunch. There are no bilateral gains to trade (no voluntary trade would occur between any arbitrary pairing of individuals). And yet, there are clearly multilateral gains to trade. The solution, we are told, is to introduce a monetary object and endow it to Adam, who may then purchase his breakfast from Betty with cash. Betty then uses her money to buy lunch from Charlie. Charlie then uses his money to buy dinner from Adam, and so on. 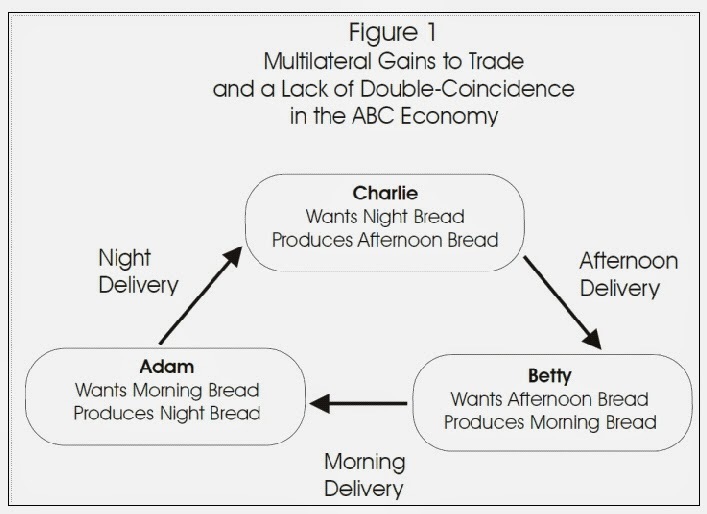 As anthropologists have pointed out for a long time, there is really little evidence of trade taking this form in primitive communities (see: Famous Myths of Fiat Money, by Dror Goldberg). Instead, these societies operated as "gift giving" economies, or informal credit systems. The principle should be familiar to all of us: it is reflected in the way we trade favors with friends, family, and other members of social networks to which we belong. What then, explains monetary exchange (really, the coexistence of money and credit)? According to Kiyotaki and Moore, Evil is the Root of All Money. "Evil" here is interpreted as the existence of untrustworthy (noncooperative) people. Untrustworthy individuals readily accept gifts from the community, but cannot be trusted to fulfill their implicit obligation to reciprocate in-kind when an opportunity to do so arises. However, we know from game theory that a system of "cooperative" exchange might still be sustained if untrustworthy people can be compelled to behave properly, say, by the threat of punishment for noncompliant behavior (e.g., ostracism from the community). The punishment/reward system that implicitly exists in gift-giving societies requires (to the extent that some community members are untrustworthy) a communal monitoring of individual behavior. In small communities, "everybody knows everything about everyone" and so this is arguably why "communistic" societies can be sustained in small groups. It also suggests why the arrangement breaks down for larger groups. The virtual communal data bank -- a distributed network of computer brains -- is simply not capable of recording all the information necessary to support an informal credit system in a large population. In a large population, people can remain anonymous. We necessarily become strangers to most people. And its tough to trust a stranger (a person you are not likely ever to meet again). Nevertheless, multilateral gains to trade may still exist even among strangers. And if credit is difficult, or impossible, then the solution is money (see: The Technological Role of Fiat Money, by Narayana Kocherlakota). According to this theory, money serves as a substitute for the missing communal memory. Contributions to society are now measured not by virtual credits in the collective mind of the community; instead, they are recorded by money balances (this assumes, of course, that money, like virtual credit, is difficult to counterfeit/steal). So, in a nutshell, economic theory suggests that we use informal credit arrangements to govern exchange among people we know (family, friends, colleagues, etc.) and we use money to facilitate exchange with "strangers." The emergence of money then seems tied to the emergence of strangers. An obvious explanation for this is population growth (and the associated rise of large urban areas). One thing I learned from Graeber is that the relative importance of money and credit seems to have waxed and waned over time. Money (in particular, coinage) emerged around 800BC and remained significant until about 600AD, an era associated with many great empires, and the associated need to pay transient professional armies. With the collapse of the great empires, new states emerged, increasingly under the regulation of religious authorities. Coinage declined in importance, with credit systems taking over (600AD-1450AD). This latter observation is consistent with the general decline of urban areas in western Europe, but Graeber points to many other factors as well. Monetary exchange waxes once again with the age of the "great capitalist empires" (1450-1971AD). My comments above only scratch the surface of the book's much broader thesis concerning the moral nature of debt. The presentation is not as clean as it could be, the analysis is sloppy in several places, and the conclusion is rather weak but, heck, it's still a very interesting read. If nothing else, it encouraged me to interpret various aspects of history in ways that I am not accustomed to. And one of the things that really fascinated me was the moral power of the idea of debt. I would tell stories to people, very sympathetic people, liberal lawyers, well-meaning do-gooder types, and you’d tell these stories about horrible things. You know, in Madagascar, for example, the IMF came in with these policies, you have to cut the budgets because, god knows, we can’t reduce the interest payments you owe to Citibank, they owed all this money. And they had to do things like get rid of mosquito eradication programs, as a result that malaria returned to parts of the country where it had been wiped out for a hundred years and tens of thousands of people died and you had dead babies being buried and weeping mothers. I was there, I saw this sort of thing. You described this to people and the reaction would be, well, that’s terrible, but surely people have to pay their debts. You’re not suggesting they cancel it or default, that would be outrageous. And one of the things that really fascinated me was the moral power of the idea of debt. I'm not completely sure, but if I was to relay this story to the average person I know, I would hardly expect them to say "well, that's terrible, but surely people have to pay their debts!" I'm pretty sure that most of the people I know would have replied "that's $^%& outrageous!" But then, maybe I don't know too many "sympathetic" people, liberal lawyers and well-meaning do-gooder types. Moreover, I'm pretty sure that a significant majority of the people I know would have questioned the claim that the IMF kills African babies. After all, we are not speaking here of a paragon of good government. In the 1980’s Madagascar stopped using DDT and immediately had an epidemic of malaria, resulting in the death of more than 100,000 people. A strong malaria epidemic with a high mortality rate occurred on the Madagascar Highlands in 1986-88. Vector control and free access to antimalaria drugs controlled the disease. This latter source also mentions the lack of immunity and a shortage of medicaments as factors contributing to the mortality rate. Is Graeber suggesting that the shortage of medicaments was the consequence of IMF imposed austerity measures on Madagascar's government and the desire to service Citibank debt? It seems an unlikely story (although, it's not easy to find details). According to this data from the World Malaria Report, almost all the resources for fighting malaria in Madagascar originates from international aid organizations, like USAID and The Global Fund. Did the IMF prevent these agencies from doing their good work? Finally, let me point readers to Ken Rogoff's defense of IMF policies here. See also the article here, by Masood Ahmed. Graeber has many useful and interesting things to say in his book. I personally find it annoying that a scholar and writer of such high caliber has to resort to stories like this to sell his ideas. But maybe that's just me. In any case, my recommendation is to read the book and filter out as much of the noise as you can.